It's completely free to use Givebutter. You don't have to pay anything to create an account and run a campaign, and you'll never see a bill from us... unless we hire someone named Bill. You can view our pricing page for a full breakdown of our different products and their associated fees. Note that Givebutter does offer a Pro tier which may include additional fees (request a quote). Our 0.5% average fee is made possible by the fact that over 90% of donors across all campaigns on Givebutter have chosen to cover this fee. 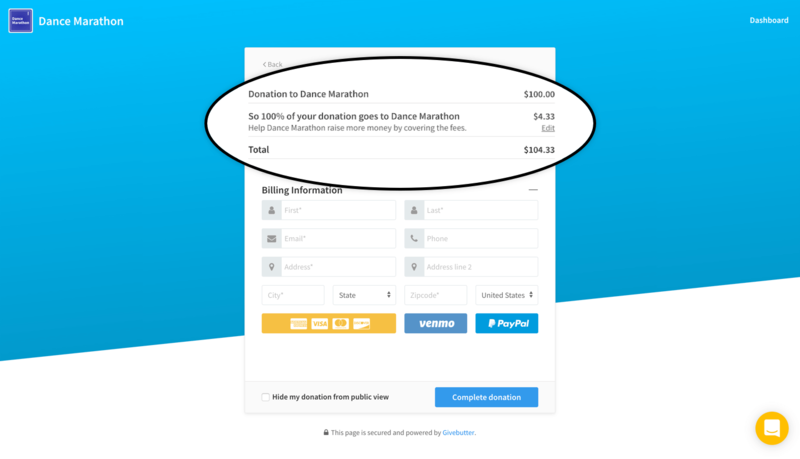 In the rare event that a donor chooses to not cover their fee, Givebutter takes that same fee out of the full donation amount. The user then receives the remainder without actually pay anything out of pocket. Let's say you received 100 donations of $100 each ($10,000 total). Based on our 90% metric, let's assume 90 of your 100 donors covered the fees associated with their donation. That means 10 donors chose not to cover the $4.33 fee on their donation. As a result, your fee is 10 x $4.33 = $43.30. Therefore, when you withdraw your funds you will receive $10,000 - $43.30 = $9,956.70. What is this in percentage terms? Transparency, transparency, transparency. Online giving has a cost - credit card fees, hosting, support, maintenance, R&D, etc are all costly expenses that using a platform like Givebutter absolves for you. And by making donors aware of that, you are not only providing them with absolute transparency but also raising more funds in the process. What are the fees per transaction? All products include every feature in the Givebutter Platform at no additional cost whatsoever. See our pricing page for a full breakdown on the differences between products. Note: Givebutter Pro customers may be subject to different fees – request a quote or contact us with questions about your plan. All transactions are subject to an additional standard payment processing fee of 2.9% + 30¢. Please also note there is a $3 fee for bank and check withdrawals, which is automatically waived for payouts greater than $1,000.